Bruce, (1853). North is to the right! 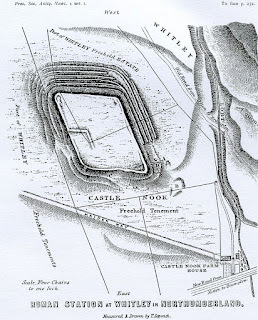 Whitley Castle Roman Fort – or, more properly, Epiacum – lies on the Northumberland side of the county border with Cumbria a couple of miles NW of Alston. It is, of course, one of many such Roman remains scattered across the North-East, but this one is rather special in two ways. Firstly, it is lozenge-shaped, as opposed to the standard playing-card set-up. This is due to the lie of the land hereabouts – a 1,050-ft high remote spot in the foothills of the Pennines – and the distorted ground plan is accentuated by the similarly skewed layout of the internal buildings. Its potted history is a familiar one: Iron Age site, followed by a Roman camp, then a full-blown fort c.120AD. There appear to have been rebuilds in c.200AD, then again around 300AD. Its shape is, we think, unique in the Roman world. Additionally, it has the most complex system of defensive earthworks of any known fort in the Empire – an astonishing claim to fame. There are multiple banks, ditches and folds in the landscape outside the stone ramparts of the fort itself – it being suggested that the main purpose of the stronghold was to control and protect lead and silver mining in the area. Despite its rather special features the fort has never been fully excavated and to this day lies largely undisturbed under permanent pasture. It is perhaps the greatest archaeological monument in the north of England yet to be uncovered. In memory of Robert Baxter, of Far-house, who died Oct 4 1796, aged 50*. I, being harmless, was betrayed. That laid that poison there for me. The story goes that Mr Baxter, during the course of his shepherding duties on the fell, came across some bread and butter neatly folded up in paper. Being peckish, he ate it, but was soon seized with violent convulsions, and eventually expired – but not before pointing the finger at a malicious neighbour with whom he had recently quarrelled. The bait, he said, had been laid deliberately to kill him. It seems that the accusation was widely believed, but no inquest was held on the man’s body, so the suspect (whoever he was) was never charged. Quite how this monumental inscription got past the eye of the incumbent vicar we shall never know. Eventually, though, someone saw fit to chip off the offending verse – and I believe the stone itself is now broken (can anyone confirm this?). 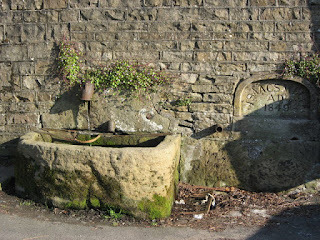 Isaac’s Well sits quietly by the roadside of the main thoroughfare of Allendale Town in the valley of the River East Allen. It is one of several relics in the area with direct links back to a famed local eccentric and philanthropist by the name of Isaac Holden. But what makes the story of this particular do-gooder so extraordinary is that despite his prolific fundraising he himself had barely two pennies to rub together. Holden began his working life as a lead miner, but when his local mine closed he and his family were threatened with destitution. So, whilst his wife, Ann, ran a little grocery shop in Allendale, he decided to start a modest venture of his own as an itinerant tea seller. And so he began his wanderings over the moors surrounding the town eking out a living as best he could for the rest of his working life. Isaac's Well is named after Isaac Holden (c.1805-1857), a local tea seller who raised the funds for its construction. Fresh, clean drinking water not only helped overcome the threat of cholera and typhoid but also made better tasting tea. Although no longer safe to drink from, the well now lies on the route of ‘Isaac's Tea Trail’, a walk that follows the tea seller’s footsteps through the North Pennines. Isaac’s most famous ‘scheme’ was his last, raising money by selling photographs of himself for a ‘mystery’ cause. Turns out it was for the purchase of a hearse for use by the folk of the West Allen area for the princely sum of £25. It was quite a gesture, as dignity in the face of one’s death and funeral was of the utmost importance at the time, of course – no matter how poor you were. Now there’s a life well lived. Whitfield Hall is a private mansion on the banks of the River West Allen, set against the rugged backdrop of the Pennine Hills. The estate has been in the hands of the Blackett and Ord (and Blackett-Ord!) families since the 12th century, and sprawls over a not inconsiderable 18,000 acres or so. The current (and very difficult to see) house was erected in 1785. 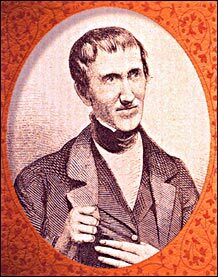 Creevey (1768-1838) was a Whig politician, and though not a wealthy man, was able to maintain an extraordinary network of high-flying contacts through the sheer force of his personality. Crucially, he kept journals, diaries and all of his correspondence – all of which was written in an open and wittily honest style. Though not all seem to have survived his death, enough found their way into the upper reaches of Whitfield Hall (via his step-daughter, Elizabeth Ord) to give us a fascinating glimpse into the political and social life of the late Georgian era – and all in a most outspoken manner! It has been a damned serious business... Blucher and I have lost 30,000 men. It has been a damned nice* thing – the nearest run thing you ever saw in your life. … By God! I don't think it would have been done if I had not been there. It wasn’t the only thing he said to him, but it has become the most oft-quoted – and wouldn’t have made it into the light of day at all but for an accidental find at Whitfield Hall a little over a century ago. The Creevey Papers, as they became known, were part-published in 1903, and the original collection is now held by Northumberland Archives.